The mystery of the Roman dodecahedron’s are well documented, these typically bronze objects have been found in multiple locations across what was once the Roman empire. The Roman dodecahedrons offer up an interesting problem, what were they used for? Typically bronze, but occasionally made of stone the dodecahedrons are truly fascinating looking objects. The dodecahedrons themselves have been well discussed by Roman experts, historians and ancient artifact fanatics and there is still no conclusive answer on their use. The fact that the mystery of the Roman dodecahedrons hasn’t been solved yet truly marks them out as one of the most interesting ancient artifacts ever to be found. In the case of the Roman dodecahedrons, their visual appearance is striking, and as the old saying goes, a picture tells a thousand words, in the case of the dodecahedrons a picture is a much more succinct way to show their appearance. If you were going to try to describe them, they are of course a dodecahedron which is a geometrical shape that has twelve flat faces, and each face in a pentagon, a five sided shape. The Roman dodecahedrons are also embellished with a serious of knobs on each corner point of pentagons, and the pentagon faces in most cases contain circular holes in them. As we mentioned early a picture is really the easiest option. Some of the Roman dodecahedrons are basic in design, some have patterns and markings on them. A dodecahedron found in Germany has circular grooves around the holes on the faces, whether there are decorative or function is another mystery these ancient Roman artifacts offer up to us as simple questions. The size of the Roman dodecahedron is deceptively small, when looking at photos it’s hard to gauge the scale. In reality the dodecahedrons are small enough to fit into the palm of your hand and were typically anything from two to five inches in diameter. Where were the Roman dodecahedrons found? The Roman dodecahedrons have been found in many locations in Europe, but all where are some point involved with the Roman empire. the biggest concentration of findings of the dodecahedrons have been in central modern Europe in what is now France and south west Germany. The most northerly finding of the dodecahedrons are in north east England, just under the border of Scotland, where three have been found. Next we have around three found in South Wales, which is on the west coast of the United Kingdom. Moving now to the south east of England we believe another four were found in what would now be locations around the outskirts of London. As we move across the English Channel there have been numerous found in what would now be the Netherlands or Belgium with around seven or eight found here we have been told. Moving directly south where there have been numerous examples found in what would be Frankfurt or that region moving down to France and Switzerland. 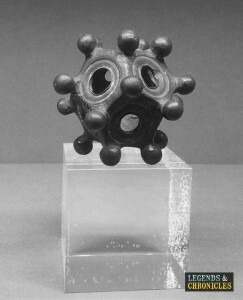 The most easterly examples are found in what would now be the Czech Republic, Slovakia, Hungary and Austria, with a handful of Roman dodecahedrons found in this region. Moving East again we find a large percentage of the examples found in what is central France, with the most southerly found near to what is now Marseilles. While we don’t have an accurate count of all the Roman dodecahedrons, it is believed there has been anywhere from sixty to one hundred examples found to date. Due to their unique appearance, non obvious usage and the fact that there is no documentation or notes about them from their time of creation, the Roman dodecahedrons have long been discussed in regards to their actual usage. We have some of the more common theories listed here, but of course they are just that, theories, and it’s quite likely we may never truly know what the dodecahedrons were created for. It been tested and tried by various people, and even papers have been published on the Roman dodecahedrons use as a measuring device. These theories typically fall in a few categories. One measurement theory is that the dodecahedrons would be a range measuring object, this could explain the different sizes holes in the pentagrams. Maybe they were used on the battlefield for judging projectile attacks or ballistics on the Romans opposition. 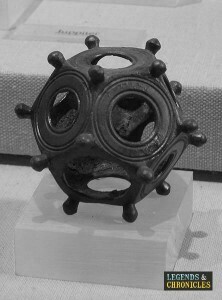 Another usage of the dodecahedrons is that it could have been used as a surveying and levelling device similar to the range finding theory. how exactly this would work though has yet to be fully explained, reasoning that would lead most to believe this theory isn’t correct. Finger measurement is another theory presented by some, the different gauge holes could represent different finger sizes but this theory is also unproven, and if these were the case would the varying holes not contain some reference key? Other mentions have said the artifacts could have been used by ancient Roman plumbers, who would use the dodecahedron to accurately measure pipe width. The dodecahedrons have often been claimed to be ancient religious symbols for druids. This could be a feasible claim, it would explain why so few have been found, but if this were true, we would probably have more written evidence of their purpose or significance. While this is one story that is often mentioned when the dodecahedrons are discussed i don’t believe it carries that much merit. The reason this is a possible option is because when one of the Roman dodecahedrons was found, there was wax residue inside. Does this mean it was used at some point as a candle holder? Probably yes, but i doubt that was its intended usage. Some have described the Roman dodecahedrons as simple playing pieces for a game thought to be similar to bowls. Maybe the Romans would have carried these with them in times of war or when boredom struck, the soldiers would take out their dodecahedron and partake in a simple game. The rules were probably simple decide on a marker and every Roman would throw their dodecahedron to get the closest possible. Another potential game could have been again similar to bowls, but this time the Roman dodecahedron would be the marker. The the players would pick up stones of a suitable size and each throw to land them in the dodecahedron. Some theorists have stated that the dodecahedrons could be some tying device, with the knobs being used to tie ropes, maybe even used in the construction of tents, or marquees, although if this was the case would more Roman dodecahedrons not have been found? The Roman dodecahedrons are truly one of our favourite ancient artifacts. Their unique appearance, the beauty of their geometry and the fact that no one truly knows their use just enhances their appeal. Many have attempted to solve their riddle, historians, scientists, and everyone who sees the Roman dodecahedrons will have their own idea on what these fascination Roman artifacts may have been created for. Browse all the additions to Legends and Chronicles.